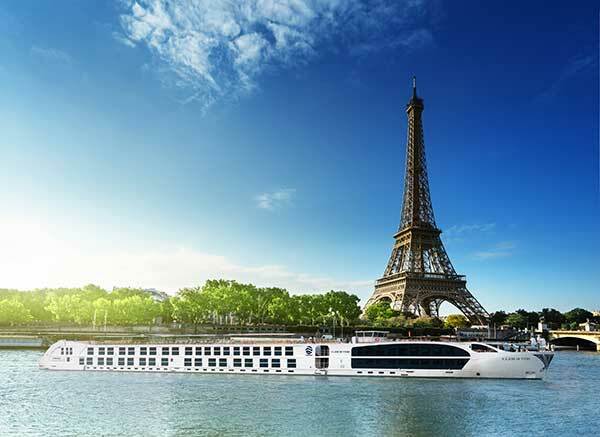 Uniworld Boutique River Cruise Collection will introduce their new masterpiece, the one-of-a-kind Super Ship, S.S. Joie de Vivre, sailing along France’s historic Seine River. Aptly named S.S. Joie de Vivre, Uniworld’s new ship will reflect the French “joy of living” philosophy and their profound appreciation for food, wine, art and music. Everything from the ship’s décor and design to farm-to-table cuisine and superb local wines will be on full display for guests to enjoy. The design team from Uniworld’s sister company, Red Carnation Hotels, will once again bring their creative talents to the S.S. Joie de Vivre , designing another ship as majestic as the destination itself. French inspired handcrafted furniture with rich fabrics, antiques, art, gilded and wrought-iron accents will blend in perfect harmony with modern-day conveniences. The S.S. Joie de Vivre’s Salon de Beaux-Arts lounge will feature a collection of fine art and antiques curated from auction houses, such as Sotheby’s and Christie’s, as well as private collections. The Le Club l’Esprit comes complete with a cinema and a surrounding pool with a hydraulic floor, which can turn into a dance floor or outdoor cinema at night. Dining venues include Le Restaurant Pigalle and La Cave de Vins, a vinoteque for private dining and wine-pairing dinners. The Joie de Vivre features two Royal Suites, eight Junior Suites, and 54 staterooms for a capacity of no more than 128 guests. Each suite will be designed with its own signature style and feature enhanced amenities and services , including butlers trained to the same exacting standard as Buckingham Palace. All suites and staterooms have custom-made-to-order Savoir of England beds with unique headboards of various designs and marble bathrooms in various color-schemes. “This will be the most beautiful ship sailing the Seine and will provide every possible comfort for our guests,” says Young. The S.S. Joie de Vivre will sail Uniworld’s popular “Paris & Normandy” itinerary, and when in Paris, will dock in the heart of the city. “We made the decision to build a 125 meter ship instead of 135 meters, so she can dock conveniently in the heart of Paris,” furthers Young. Couples can save up to $1,600 by paying in full before May 15, 2016 on Uniworld’s value-packed all-inclusive cruises . Cruises include scheduled airport transfers; all gratuities onboard and onshore; port charges; all meals with unlimited beverages including, incredible local wines, craft beers, premium spirits, such as Grey Goose and Glenfiddich; daily guided shore excursions with options to personalize; in-suite butler service; concierge services; 24-hour room service; and Wi-Fi. or twitter.com/uniworldcruises using the hashtag #ExploreUniworld.